No, not turkey, not goose, not guinea fowl and not pheasant. It’s been only just over week since I lost my infernal catheter and now I’m in the expected period of leaking. I am happy to report that I believe I detect some improvement in that I seem sometimes to be able to control myself when standing up, albeit for relatively modest periods of time. It’s the standing that’s difficult; things are much better when sitting or lying down. There’s still some way to go but I think I’m moving in the correct direction. Carol and I are developing techniques to enable me to help with a few domestic chores, such as making her cappuccinos, washing pots and pans, and occasionally resuming my rôle of galley slave, all from the relative safety and drier comfort of a kitchen bar stool. I’d love to be able to go out for a walk through our snowy woods but that’s trying to walk before I can stand. Not yet a good idea. However, there is one way I can enjoy the wildlife that we are fortunate enough to have surrounding us. Given our bird feeders which supplement a few entirely natural food sources, I can sit perched on my favourite bar stool and snap some of our feathered friends through various windows. Light reflections off the window glass are unwelcome but a little jiggery-pokery in some editing software can improve things and produce an acceptable result. So, after the enforced laziest Christmas I can remember, here’s a small collection of some of our entertaining Christmas birds. 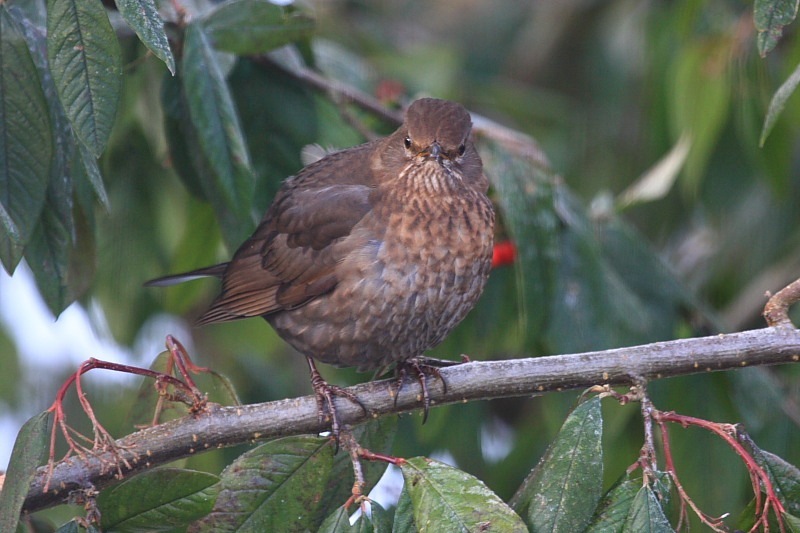 Starting with the red berry brigade: on the left are two attacking Redwings (Turdus iliacus) complete with plunder in their beaks, and on the right is the hen blackbird (Turdus merula) that mounts such a staunch defence, not only against the Redwings but also against all other blackbirds. 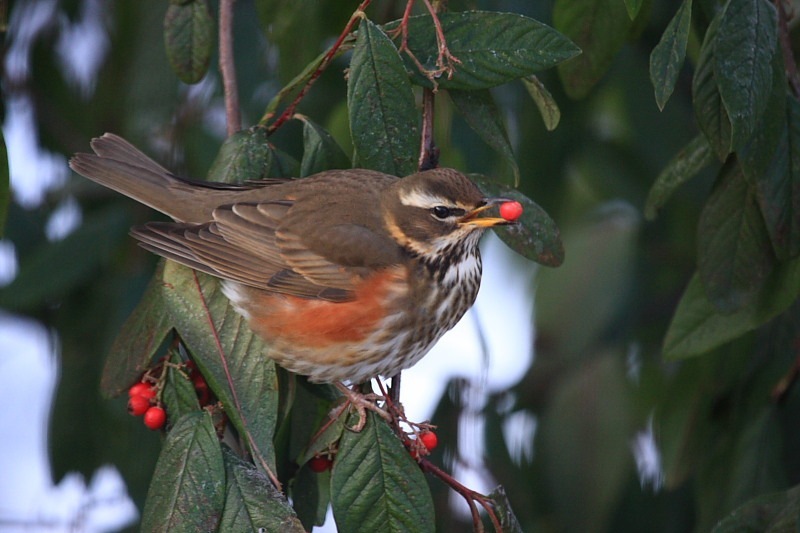 There are so may Redwings popping in and out of the berry bush that it’s far too easy to overlook birds of a similar appearance. 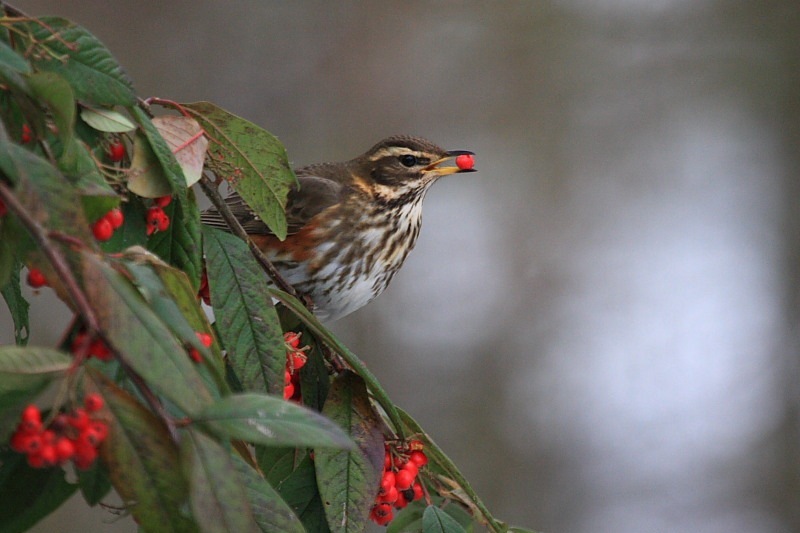 I nearly did so when I looked at “another Redwing” eventually noticing that it lacked any red. 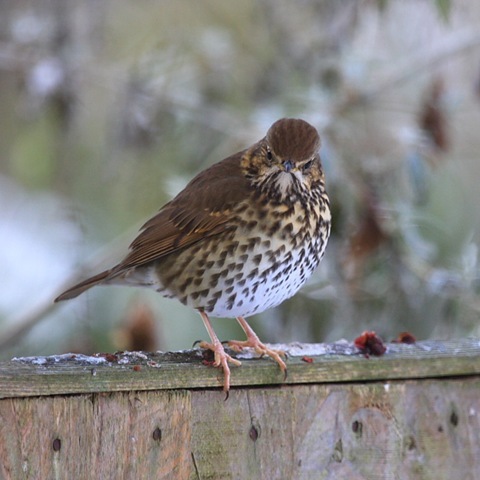 Whoops – a Song Thrush (Turdus philomelos) had come visiting. Here it is looking rightly a little indignant over my initial reaction. Accusing it of being a foreigner, indeed! 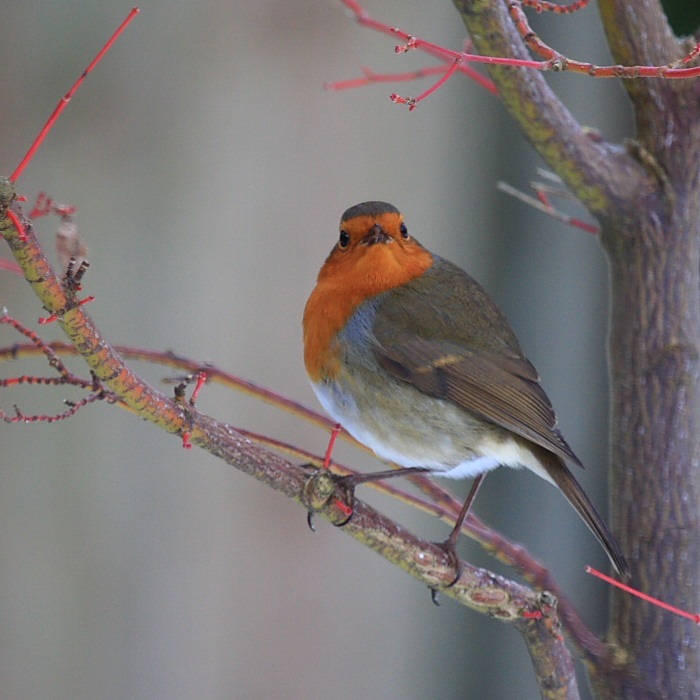 After a quick feed on some scattered nuts and seeds, a Robin (left – Erythacus rubecula) hopped up onto the winter skeleton of an Acer and appeared to look straight at me as if it knew I was watching. Last and certainly not least, is this little gem of a bird. 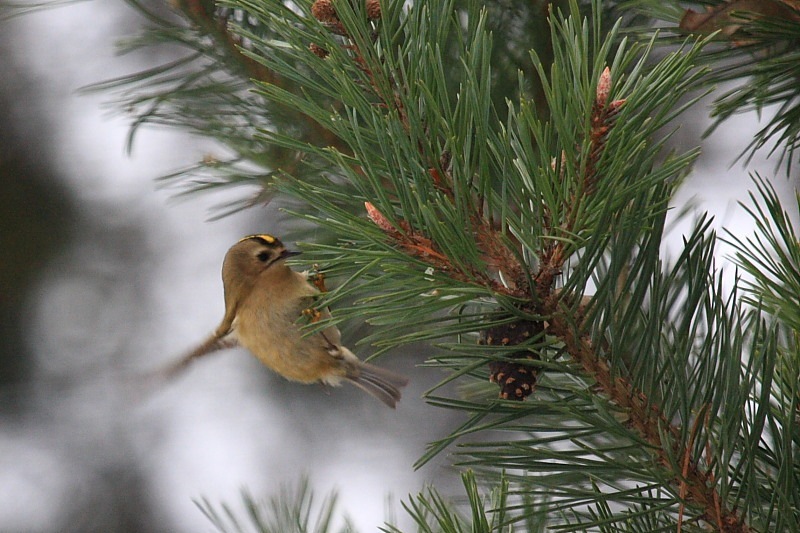 We are lucky enough to have Goldcrests (Regulus regulus) more or less resident in a sizeable conifer in our front garden. Apart from being Britain’s smallest bird (I think), they are also very fast and zoom frenetically about the tree after food. This combination of size and movement makes them buggers to photograph. From the comfort of an office chair I got this, my first mostly recognisable Goldcrest shot, together with about a dozen failures. 6/10 – must try harder. Paul Purdhomme cooks sitting on a stool. Thought you were off on a cruise? Chef Paul must need one helluva stool!